Sinclair Int’l has a new product that can make your front rest more secure, and easier to level on a bench. 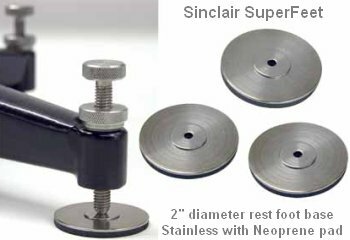 The Sinclair Superfeet, item 04-190, are 2″-diameter stainless disks with a layer of neoprene on the bottom side. The top dimple holds the rest foot point with no wobble, and the neoprene underside is secure on bench surfaces of concrete, wood or glaze-coated concrete. Your rest won’t shift or slide when you push the rifle forward. Sinclair tells us “With the Superfeet, you don’t need to hammer the rest screws into the bench top. And most shooters find that their speedscrews or elevation cams work better with Superfeet”. Sinclair’s Superfeet come in a set of three for $19.95. 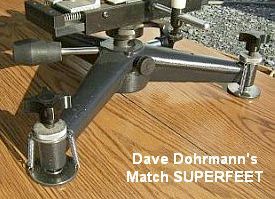 The Sinclair design is similar to the Match Superfeet created by Dave Dohrmann. Dave’s Match Superfeet are also 2″-diameter stainless disks with neoprene on the bottom. But Dave’s Match Superfeet also have spring attachments, which connect the feet to the rest. This makes it easier to pick up the entire rest and reposition it. The spring attachments also ensure that the system is completely legal in IR 50/50, NBRSA and IBS Competition. A set with 3 discs and 3 spring retainers is $29.95, while a set with 3 discs and 2 retainers is $27.95. Contact Dave at (864) 884-0155 or via email dbugholes [at] aol [dot] com to order his Match Superfeet. Share the post "Bases for Pedestal Front Rests"
Credit German Salazar for this smart tip. 6XC dies tend to be pretty expensive. If you already have a 6BR neck-sizing die, you can use it to neck-size 6XC brass. Redding Reloading sells a set of three washers that raise the die in the press, part number 80901. Each kit includes three spacers: (.062) No-crimp or partial resizing, (.125) 44 Spl/44 Mag spacer, (.135) 38 Spl/357 Mag spacer. If you buy two sets (about $7.00 each at Bruno Shooters Supply) and use both 0.125″ spacers and one 0.135″ spacer then you can neck size 6XC cases with your 6BR neck sie without messing with the lock ring setting. You can also use the same spacers to switch pistol dies (e.g. between .38 Special and .357 Magnum). Hornady also sells inexpensive .135″ spacers to switch from .38 spl to .357. Share the post "Using 6BR Dies to Neck-size 6XC"